6: Have Players name important landmarks. 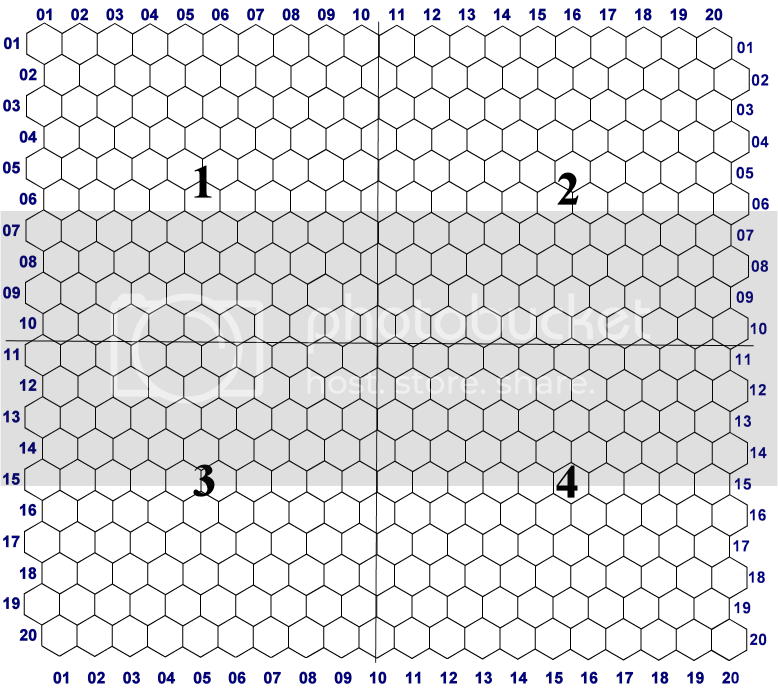 The entire map is 20 X 20 hexes, and each hex equals 2 miles. I took the county map and lightly marked it into 4 regions, each made up of a 10 X 10 hex segments. I quickly numbered these 1-10 both north and south so I'd have a quick grid to cross reference for this step. NOTE: During this creation phase, one player said Giant Trees, and rolled the placement. It dropped the trees directly onto Grand Lynn, and thus in a moment the Trees of Soaring Woodhelvin were born. (Covenant place of fame). Other interesting points – all rolled at random were the waterfall placed at Coppice, a point coming down out of the Crestfallen Mountains, a Tomb on island in the middle of a lake just South of Yggsburgh, and the Geysers of Sarangrave Flat (Covenant place of fame). All told, I really enjoyed this, and later on the player whom had said Swamp stated in character during their first foray versus a tough collection of Swamp Gobbers “Why oh why did I mention swamp..Bleh!”. That made my day. 7: Add Mountain and Hill features. I dropped in a range of mountains and hills wrapping them around and through the trade route, taking special care to leave room for other “special landmarks” not added by the players. 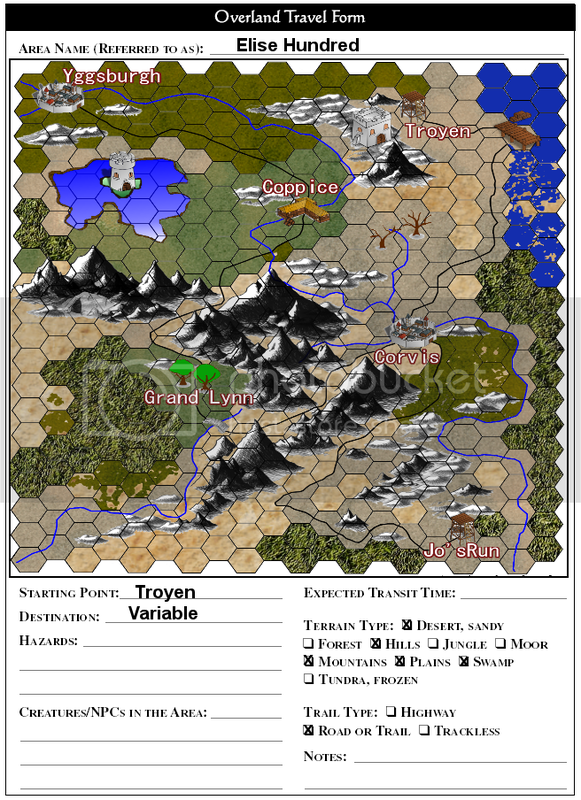 I stuck with a basic layout here, using a D6 for each side of a standard hex when I needed to make a decision about the direction a feature would run. 8: Define Lakes (if applicable). I rolled a set of D6 to help create the lake outline. In directions leading towards rivers I placed a 1 hex beginning line to aid in remembering to make connections (where needed). 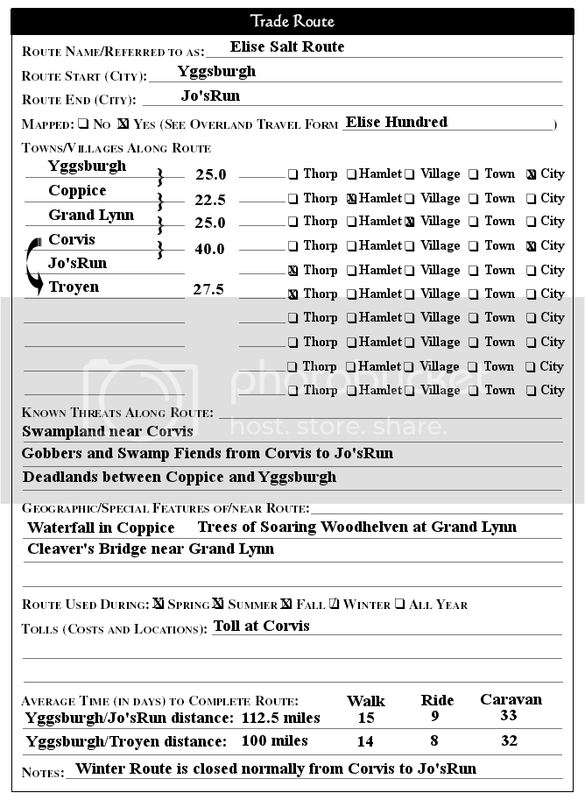 Knowing that Yggsburgh and Corvis needed 3 rivers to properly exist, these two features were drawn one hex away from both cities. In addition, a major landmark, a waterfall at Coppice required a major river above and below it. Lastly, the lake river inlet was created. From there, I had the players roll D6 to plot the rivers, ensuring they hooked up, although I was pleasantly surprised how easy and natural the river systems turned out. 10: Add traditional vegetation features. Once the mountains, hills, river and lakes were added, the final step was to draw in traditional geographic features. These included forest, plain, grassland and ensuring that each feature blended well with the one near it.